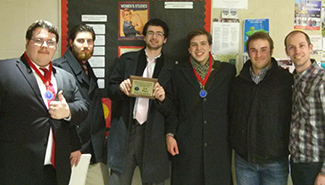 The Parliamentary Union, Wabash College’s debate team, took third overall at the Indiana Forensic Association state debate tournament on the campus of IUPUI. Fritz Coutchie ’15 and Nick Freeman ’15 competed in the varsity division while James Fritz ’16 and Steven Peters ’16, competed in the junior varsity division. Debate topics ranged from whether or not Indiana should implement a pre-K voucher program for low income families to the problems caused by Federal invasions of privacy. Purdue, who won the varsity division, also placed first in the state competition while IUPUI, who closed out the junior varsity division, placed second. There are four more tournaments on the spring calendar for the Wabash team, including worlds-style nationals at Purdue University, April 11-13.